Today marks the introduction of Ryanair’s latest baggage fee policy, which means passengers will only be allowed to bring on board one small personal item as free hand luggage (40 x 20 x 25 cm). To bring a larger wheelie suitcase on board, passengers must pay for ‘Priority & 2 Cabin Bags’, at £6 a go. This is just the latest in a string of baggage policy changes over the years. Ryanair was one of the first airlines to introduce checked baggage fee charges, back in 2006, followed by check-in fees in 2009. Charges to reserve seats and hand luggage fees have also been rolled out by Ryanair over the past few years. 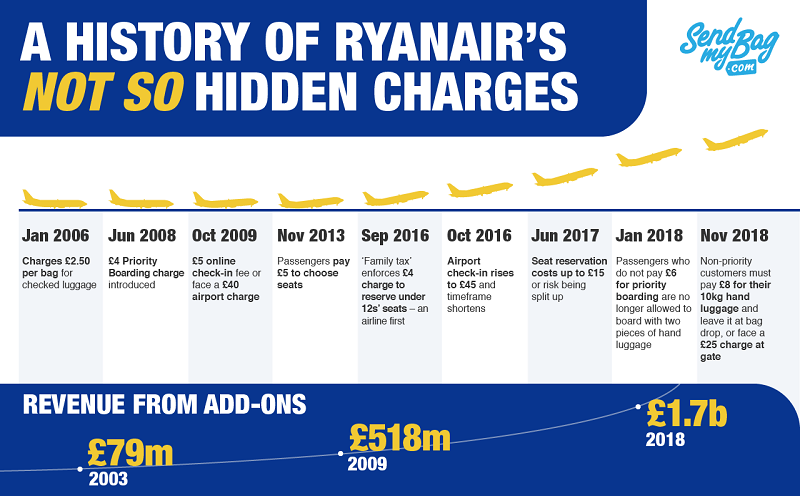 It is, therefore, not surprising that Ryanair is enjoying a healthy income from add-ons, with the company’s revenue from such charges increasing dramatically from £79m in 2003 to £1.7bn in 2018. While Ryanair appears to be a low-cost way to travel, it is in fact forcing passengers to pay much more than they bargained for in order to benefit from the very basics of air travel, such as hand luggage and the ability to sit together with your family. Why not avoid Ryanair's baggage fees by sending your luggage ahead, and enjoy the luxury of a luggage-fee journey.